L. fermentum, L. acidophilus, S. thermophilus, E. faecium. L. casei, L. fermentum, L. acidophilus, S. thermophilus, E. faecium, anticaking agent (magnesium stearate). Sachets: 1 sachet a day mixed with water. To be taken on an empty stomach. (The sachets of lactic acid bacteria are reactivated when the powder is mixed with water.) One rest day per week is recommended. 3 capsules: Lactic acid bacteria: L. casei, L. fermentum, L. acidophilus, S. thermophilus, E. faecium (total 4,5E9 cfu*). Sachets (1sachet): Lactic acid bacteria: L. casei, L. fermentum, L. acidophilus, S. thermophilus, E. faecium (total 7,5E9 cfu*). Sales authorisation in the EU (number AS 2251/3). 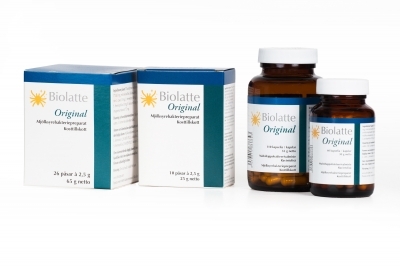 Read more about product development of Biolatte Original here.